Coconut Sugar Cookie Bars ~ Learn, Live, and Explore! It feels like I haven't baked something in such a long time. This weekend, I wanted to bring something to a high tea themed event, so I decided to make a bite-sized sweet treat. 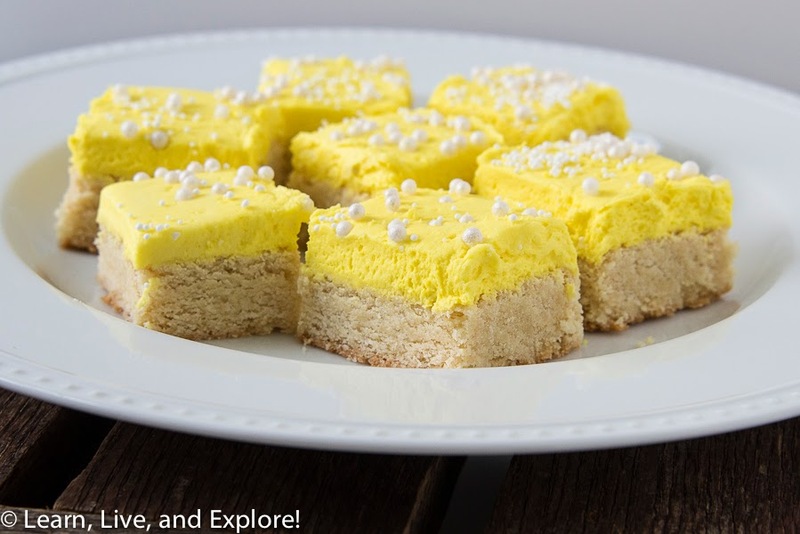 Sugar cookie bars have been on my to-do list for a while now, and they are very easy to make, so it was settled. I sourced several different recipes and ended up with the one that required less flour, since my stock was low and I was being lazy about going to the grocery store. Baking is without a doubt a precise activity when it comes to ingredients and measurements. Fortunately, buttercream is a little more forgiving because when I absentmindedly reached into the cupboard to grab the vanilla extract, I took the coconut extract instead. I didn't realize my mistake, of course, until I watched clear liquid, not brown liquid, pour into my buttercream. I balanced out my mistake with the vanilla that was supposed to be in the bowl and hoped for the best. The end product was actually quite delicious, assuming you like coconut as much as I do. 9. For the buttercream, in an electric mixer, put all the ingredients in the bowl and mix until combined. Add additional milk if the consistency is too thick. 10. Mix in preferred coloring, then spread on top of the cooled cookie block.